You have a beautiful picture with the perfect frame but there’s only one problem: there’s nothing to cushion the frame from being flush against the wall. Even the slightest adjusting can cause a scrape or a scratch which can damage your wall or etch your paint off. Frames shouldn’t rest flush against walls. Over time, the damage can become a noticeable dent or outline of wear the frame rested up against the wall. For fine homes, all of the above is unacceptable. The easy solution is Furniture Buffers rubber-foam furniture pads. These will stick and hold to any frame while gripping the wall so the frame doesn’t jostle back and forth. Moreover, the rubber-foam technology absorbs and deadens any shock to both the wall and the picture frame. So imagine a slightly careless home decorator was trying out a framed family portrait across several spots in the house – you wouldn’t have to worry about wall damage because the 4 pads in each corner of the frame would protect both the wall and the frame on each fitting. 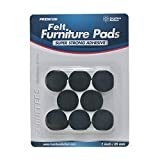 Read more on how these non-slip pads can keep furniture place. Additionally, picture frames wear on walls over time but with a cushy, rubber-foam pad on each corner, there would be no lines or indents in the wall afterward because the harsh, hard corners of the frames wouldn’t be right against the wall. 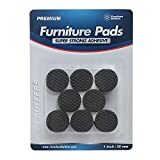 Click here to buy Furniture Buffers non-slip furniture pads and protect your walls now.